Did everyone in the US have a good Thanksgiving? I love the holiday because it lands on a Thursday every year so that basically the entire United States takes off for a five day weekend and everything shuts down. But the Japanese don’t celebrate and thus Nintendo was hard at work getting this weeks VC and WiiWare games ready to go. Fine, maybe releasing SPACE INVADERS GET EVEN (Taito, 1 player, Rated E10+ for Everyone 10 and Older-Cartoon Violence, 500 Wii Points), Pit Crew Panic! (Hudson Entertainment, 1-4 players, Rated E for Everyone, 800 Wii Points) and METAL SLUG 2 (NEOGEO, 1-2 players, Rated T for Teen-Blood and Gore, Violence, 900 Wii Points) isn’t that much work, but either way they’re here. Space Invaders Get Even allows everyone to play as the Space Invaders from the classic game of the same name. 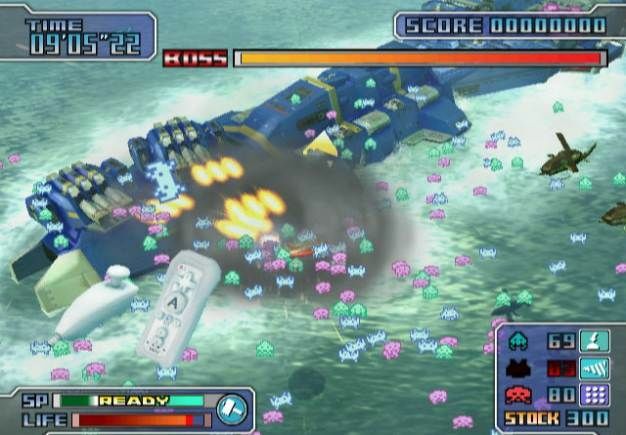 Instead of defending earth in a single ship, players take control of the Space Invader fleet and try to crush the earth’s defenses. It appears that the Invaders have learned some new tricks as controls will not simply be moving left to right in an advancing formation. Far less interesting sounding is Pit Crew Panic from Hudson. Players fix cars by using Wii Remote motions. I know I’ll probably get shot for saying this but I’ve never been that big a Metal Slug fan and as such haven’t played much of them. I hear from the web that Metal Slug 2 ain’t too shabby and if you’re a fan of shooters than picking this up would do you know harm.